“Do you like my butterfly?” I asked my junior Music class this week. 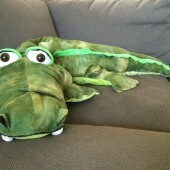 Lying on the floor, in the middle of the circle, was a 1.2 metre soft, stuffed crocodile with a rather fetching grin. One of my latest op shop acquisitions. I hadn’t planned to start the class this way. The idea had suddenly occurred to me as the students were filing in, giggling and pointing to my oversized prop. “That’s not a butterfly!” they chanted. I’ll have to use the surprise start more often. It was a very effective way to engage the students. Each one was keen to point out the teacher’s obvious mistakes and eager to display their own knowledge. There were enough differences between a butterfly and a crocodile that everyone could contribute something. And they all thought it was hugely funny that I was soooo wrong! Laughter is a great way to get anxious students relaxed and in a positive mood to work together and learn. What a contrast to last week, I thought. Back then, I’d left the class querying what I had accomplished. It was one of those lessons where the students just didn’t settle. Was it the weather? A lunchtime playground incident? Wednesday-itis? The usually attentive students weren’t. The student with “attitude” had it in spades that day. And one student kept looking at another in just the wrong way, provoking him to scream until red in the face. Yet the screamer just couldn’t stop looking at the offending child. He was like a magnet, swinging back to true north, no matter which way I turned him. Managing these interactions kept breaking the flow of the lesson. We sang, played instruments, talked about the different sounds they made, practised watching and listening for directions. But it all felt very disjointed. Today felt completely different. We were firing! So – back to the differences between a crocodile and a butterfly. They really thought about all the possibilities, within the boundaries of their knowledge. And then, a different perspective. 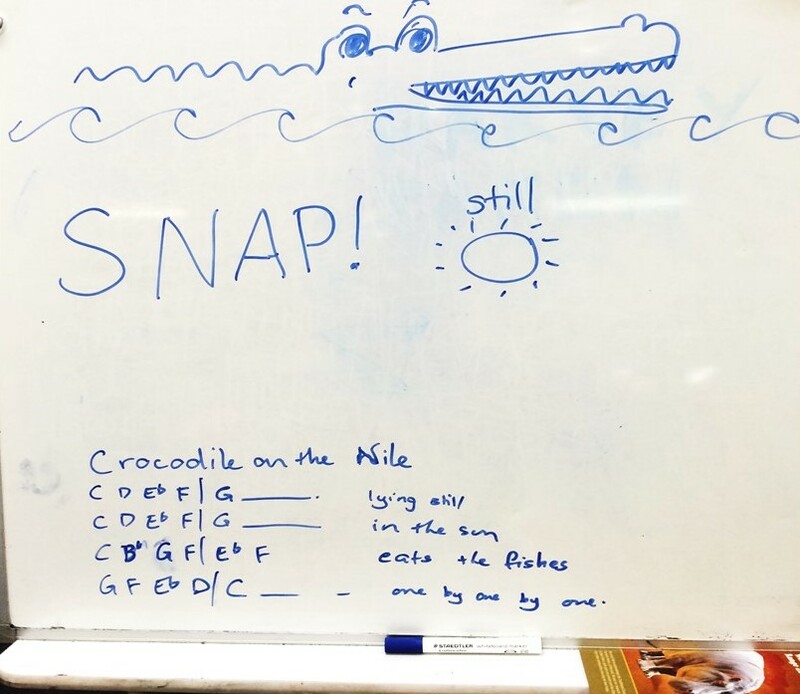 The lesson was based around a short and simple song I had written about a crocodile. Happily, it also tied into the Australian Animals unit that some of my students were doing. 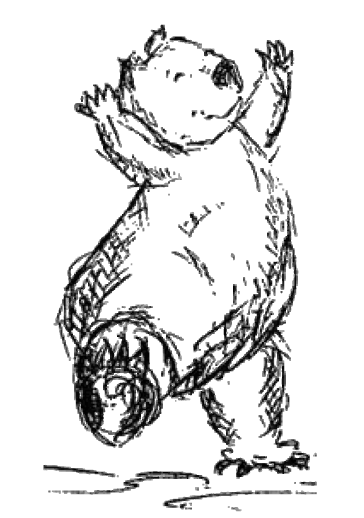 practise turn-taking (through a “call-response”approach, then maybe as a round). Also turn-taking with the props. use the xylophone – some of the students could learn a simple note pattern to repeat throughout the song. The others would just like banging the xylophone! I had my props. As well as my crocodile, I had a crocodile hat and a dinosaur puppet which I figured would serve as a crocodile, until I found one to add to my puppet collection. The students love using puppets. It gives them a persona to hide behind, boosts their confidence and draws out their creativity. It’s also good for their motor skills, as they move the puppet’s arms and mouth (or just the mouth, in the simpler puppets). I make sure that all my puppets are easy to hold. Some can feel too tight or heavy. Others can be awkward and uncomfortable to move. Having a large selection of puppets means that students who might have sensory issues with one texture will hopefully find another that doesn’t bother them. It also means that a student is likely to find a puppet that appeals to them. Interestingly, today, one of the students completely refused to wear the crocodile hat, lie down with the crocodile or hold the dinosaur puppet. My sense was that they were scaring him off a bit. He was certainly eyeing them pretty warily. Knowing how two of my own children used to be afraid of a magnificent (yet totally intimidating) dragon puppet my brother-in-law had bought for them many years ago (we actually had to keep it in a cupboard, then finally gave it away), I understood that perspective, and didn’t push him. He might have a go next week, when he’s a little more used to them. We talked about the sounds that a crocodile would make, and practised. This was followed by eliciting the sorts of actions we’d make to show we were pretending to be a crocodile – the typical “arms together from elbow to finger tip, then opening up”. Then, drawing ideas from the children, we worked out actions for “lying still”, “in the sun”, “eats the fishes” and “one by one by one”. It could just be my imagination, but I’ve found that when the students have had input into the actions, they seem to learn them faster. A short, repetitive song is quickly learned, and the students had picked it up after I had sung it through a couple of times, with them joining in the actions from the beginning. Now it was time to distribute the props. I did this, just going around the circle 1,2,3,4, to ensure that everyone had at least one turn with one prop. We could work out turns with favoured props later. Crocodile – Two students were chosen to be crocodiles – lying either side of my big crocodile. I was quite pleased with this, as they had to lie still and quietly! Good rest time – if only for a couple of minutes. 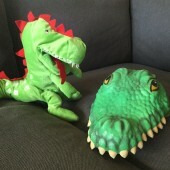 Crocodile hat and dinosaur puppet – these were also distributed in turn. Once that was done, we just sang the song over and over, as the props worked their way around the circle, and the students became more confident singing the song. We practised singing loudly and softly, and had two games of “Simon Says” in between. The games were a good chance to practise the song actions, and to break up the singing. Once the students were familiar with the song (which I was playing on the xylophone), I let them take turns playing. The more rhythmic students were able to follow the four-beat pattern. The others just enjoyed banging away and making their own accompaniment to the song. Towards the end of the lesson, the students had the opportunity to present the song to the class, in groups of three. All chose to have a go. I often do this in my lessons. It’s a good way to practise the song and singing in a small groups helps the students to develop their confidence in presenting to an audience. Then they practise bowing waiting for and acknowledging applause. As well as providing an opportunity to perform, and develop their confidence doing so, it also gives the students practise being a polite, listening audience. This is a learned skill. The teacher assistant commented that all the students were all wonderfully engaged. They certainly were – in complete contrast to last week! Instruments – Xylophone. I’d started off the song in C minor, but didn’t have all the right keys for xylophone. So, up to D Minor – the xylophone had a Bflat key, so all was okay! Then kids took it in turns to “play” the song. They had one stick – I had the other! I plan to do the same thing again. As the students will be more familiar with the song, I hope I can extend what we do with it. I’d like to try it as a “call-response” song. The quieter students tend to stop singing as the more confident students get louder. Perhaps I’ll divide the class in half and each half can take turns in singing separately, then join in together. Students holding the puppets didn’t do the actions, so maybe I can have them stand with the crocodile, and specify that those without puppets need to do the actions. I’ll make sure the reluctant student has the chance to use the crocodile hat and puppet, to see whether he has adjusted to them. If there’s time, I can bring out the rhythm sticks, and get the children to clap them together in time. Knowing that lessons rarely go according to plan, I’m sure there’ll be something else in the mix to make life interesting! In the meantime, Happy Wombatting!